Celebrating 55 Years of Skating in WNY! The Skating Club of WNY is a community of families, athletes, and professionals united by a love of figure skating and a commitment to bringing excellence to every facet of the sport. Through the quality of our staff and the energy of our members we ensure that all of our skaters have the opportunity to pursue their dreams while also giving back to the community. From the recreational skater to the Olympic hopeful, singles to teams, beginners to lifelong enthusiasts, The Skating Club of WNY welcomes you! The Skating Club of WNY is proud to host its 30th Annual Spring Skate Festival on May 17-19, 2019 at Holiday Twin Rinks. Our competition has become a premier USFS and Skate Canada sanctioned IJS event in upstate New York. Winter 2016-1017 Scribe Now Available! 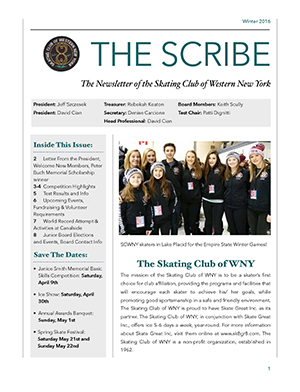 Our Winter 2016-2017 edition of our club newsletter, The Scribe, has arrived! Keep up to date with all the latest news and accomplishments of our skaters and our club! The Skating Club of WNY is a member of the U.S. Figure Skating Association (USFS). The USFS is the National Governing Body of amateur figure skating in The United States. It was formed in 1921 and had only 7 members. Today, the association has over 500 member clubs and over 150,000 skaters. Your joint SCWNY/USFS membership gives the skater the right of testing and competing through USFS. The monthly “Skating Magazine” is also included in your USFS membership dues and is sent to your home address. We are proud to offer USFS Test Sessions at periodic times throughout the calendar year. Please complete the SCWNY Test Application and submit at least two weeks prior to the test session date. Late Fees apply if application is received after deadline. Guest skaters are welcome on SCWNY Test Sessions as time and space are available. Guest skaters must supply the test chair with a letter from their home club stating that they are a member in good standing. The Skating Club of WNY is proud to provide our skaters with many opportunities to defray the expense of training through Competition Grants, Banquet/Spring Skate Festival Grants and Scholarships. In addition, full members are eligible to participate in the Seminar Program sponsored by SCWNY. SCWNY is the only figure skating club in Western New York to offer these funding opportunities. The Skating Club of Western New York is proud to have Skate Great, the largest Learn to Skate program in WNY, as its partner! 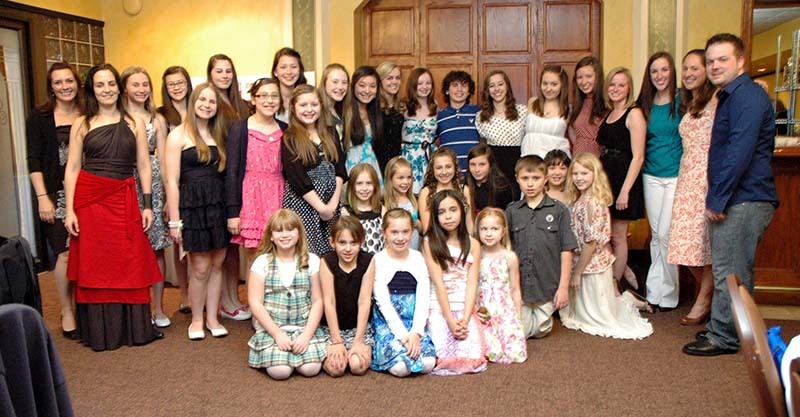 All members of the Skating Club of Western New York are invited to attend our Annual Awards Banquet and Meeting to celebrate the end of the skating season and to recognize the achievements of our skaters. At this event Special Recognition Trophies and Progress trophies are presented. The Skating Club of Western New York, in conjunction with Skate Great, proudly produces its annual ice show “Rising Stars on Ice” giving our skaters a fun opportunity to “shine brightly” for their friends and family. This year’s show is sure to be “Legendary”! Be sure to mark April 29th on your calendar! Sign up to automatically receive The Scribe, our club newsletter! Get all the latest information on our 30th annual Spring Skate Festival Competition! Show your pride in our club! The Skating Club of WNY places an annual order for apparel each fall. Stay up to date on the latest U.S. Figure Skating rules and ISU technical requirements! Skating Club of Western New York shared a post. Come out and see our annual ice show!! Tickets are $12 at the door. Skating Club of Western New York shared a link. © 2019 Skating Club of Western New York. All Rights Reserved.